Check out this gorgeous video from the Chanel Noir Obscurs shoot. More new work... 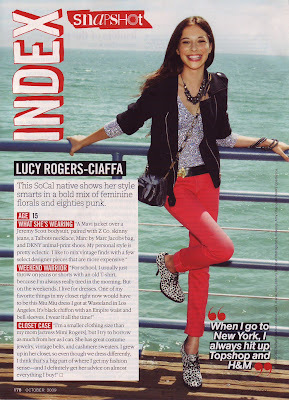 Check out Lucy Rogers Ciaffa on the back page of Teen Vogue. Lots more to come, including an editorial in my FAVORITE magazine Lula! Hey, I'm still here, I've just been working a lot... Here's some of my recent work. My website, www.amychance.com has gotten a bit of an update recently so check that out too! Sorry for the narcissism, and to keep it so brief (I'm late for work), but this is one of the coolest things I've ever read about myself! Thanks David! Chanel's new campaign for Noir Obscure is the definition of drama. These ads are hearbreakingly gorgeous! They are the epitome everything I'm loving right now.